SC Audio CD Ripper 3.5.0.5 free download. 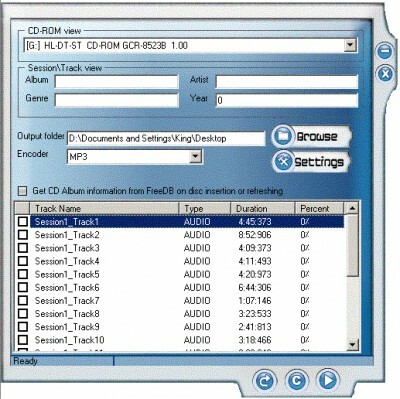 SC Audio CD Ripper and ID3V1 & V2 Tag Editor is for converting your audio-CDs collection. This tool is for ripping & grabbing audio files from CDs to your hard drive in any of the following formats WAV PCM, MP3, WMA, Ogg Vorbis files. Rips audio files form CDs. You are advised to run Ad-Aware or similar programs after installing this product. You can download such programs by clicking here. SC Free DVD Ripper and Burner is a software application to help you with CD, DVD ripping and burning. The perfect tool for converting your audio-CDs collection to WMA, OGG, MP3 and WAV PCM. Direct Audio Converter and CD Ripper is a very useful tool to convert audio files between various audio formats and rip CD audio tracks directly to WAV, OGG, FLAC, MP3, WMA, Monkey's Audio APE or MusePack MPC. Find, Organize, Convert, Transform, Play, Rip & Burn Audio files. OSS CD Ripper and ID3V2 Tag Editor - Convert tracks from audio CDs or DVDs to WAV PCM, OGG Vorbis, MP3 (MPEG Layer-3), WMA (Windows Media Audio), CDA, ALF2, ADPCM, GSM, G.